Actually, there are times when my latest adopted home’s refusal to contemplate a bit of culinary iconoclasm baffles me. But then I come from the UK, which seems obsessed with putting a “twist” on classics or, if not that, then “fusing” apparently disparate food stuffs in a desperate search for novelty. Much of the time, though, I admire the conviction that as French is best, why fiddle around with something that works well? My favourite treat, for example, is a mille-feuille (known as a Napoleon in the US and a cream slice in the British Isles). I can find one in any decent patisserie and know it will be excellent and exactly what it should be: buttery flaky pastry, a rich cream filling and a topping of glacé icing. I never have to worry that some bright spark will have tried to deconstruct it, spin it or twist it. It remains comfortingly indulgent, mouth filling and ever-so-slightly decadent while also keeping within the bounds of good taste. 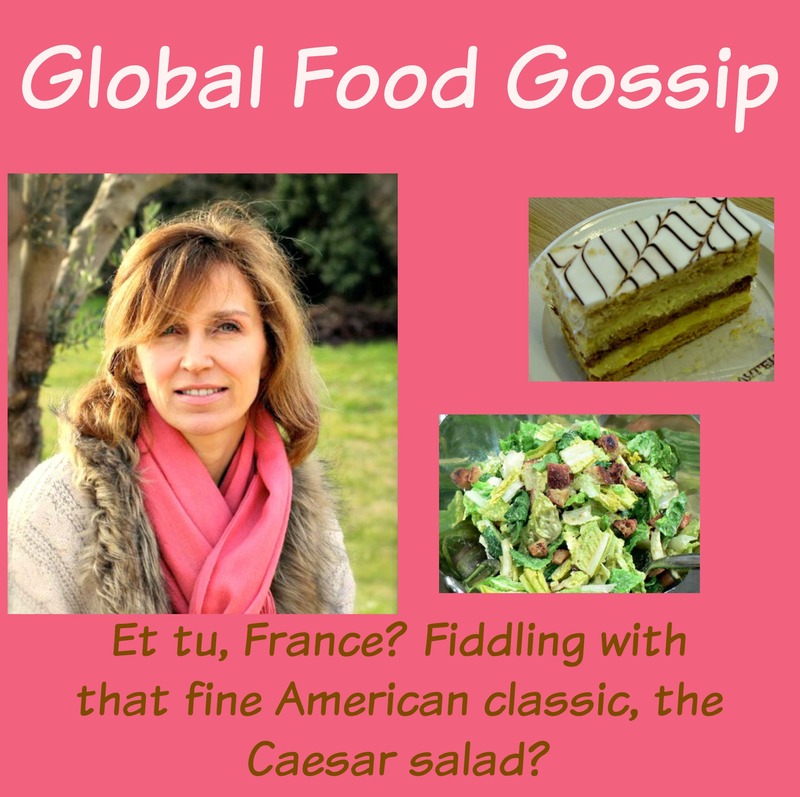 If you understand my love for the mille-feuille, it should help you see why I’ve chosen to gossip this month about France’s treatment of the Caesar salad. Clearly, the protection France affords to its own food classics does not extend to those that hail from other shores. I hesitate to suggest a conspiracy, but I have noticed an alarming tendency among the chefs in this part of the world to fiddle with recipes from elsewhere. 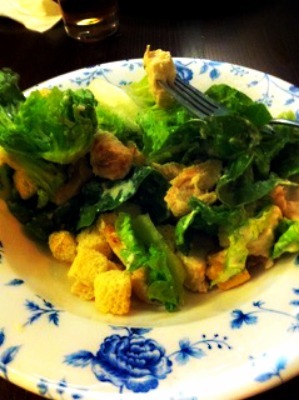 Some have claimed that there have been so may modifications of the poor Caesar salad over the years that the term “Caesar salad” has lost all meaning. While I wouldn’t go that far, I would like to point out that this American classic has been treated with reckless disregard here in France. I’ve been trying to puzzle out this very un-French behavior. Is it because of the salad’s humble origins—it was invented in Tijuana, Mexico—not to mention its current status as a menu staple in the steakhouses of Las Vegas? If so, then the French need to know that this salad is more Grace Kelly than high-kicking showgirl. Much as the Philadelphia-born star brought some film star gloss to Monaco without the tawdry Hollywood tat, the Caesar has much to offer the European Continent. Neither colourfully brash nor tartily sweet, it shows Europe that America can do class, too, and do it well. So what else has this poor salad done to deserve the indignities heaped upon its noble Roman name? It appears on countless French menus the country over, but I have yet to find one that comes close to those I have enjoyed in America. What is going so terribly wrong? The classic Caesar involves Romaine lettuce tossed in a dressing made from egg yolks, oil, lemon juice, parmesan cheese, a dash of Worcester sauce, maybe a dash of Dijon mustard and topped with croutons, possibly a sprinkling of bacon, and more parmesan. That’s it. Perfection. Leave it alone. Yet the one I had in a bistro on Cours Mirabeau here in Aix yesterday involved tomato quarters, a poached egg, slivers of raw carrot and a mixture of leaves including frisée. Frisée! (Endive if you will.) What sort of abomination is that? The bitter flavor fights the smooth creaminess of the dressing, and the springy dry texture takes over the salad’s delicacy. We’ve already discussed the tomatoes and the endive. Let’s move on to gossiping about the dressing. How can France of all places not get this right? A country where it is not considered suicidal to indulge in raw meat and egg. Readers, while I was condemned to a hygienic, bottled, nondescript white dressing lacking in any flavour much least of egg—its sole being to lubricate and aid the passage of frisée down my protesting neck—I happened to glance at the main at the neighboring table. And you’ll never guess what I saw? He was enjoying a steak tartare topped with a whole raw egg! Never lose an opportunity for culinary enhancement! And this is not the only scandalously wasted opportunity for France to show America how its food can be better done. As American devotees of the Caesar will know, there is an ongoing and passionately fought debate over whether or not the newcomer ingredient of the anchovy is too inauthentic to tolerate or a delightfully salty addition to the rather bland romaine leaves. Now, anchovies, I’ll have you know, are found everywhere in France, in all forms, and they are very, very good. Why am I such a fault-finding gossip? Readers, at this point you may wonder why I felt compelled to report on my apparently doomed search for an authentic Caesar salad here in the South of France. British anthropologist Kate Fox put her own tribe under scrutiny and reported on the findings in her 2005 book, Watching the English. She suggests that the English complain as it draws us together in adversity. If we do not complain about our lives, we risk being self-satisfied show-offs keen to prove that our lives are perfect. As we place great value on dealing well with any adversity life throws us, optimism can appear smug. Just think, if I had written that the best Caesar salads are to be found in France and only France and how happy I am that discovered this fact, my life would seem too intolerably pleased with itself for any of you readers out there to tolerate. And perhaps for that reason I take pleasure in knowing that while the French can produce the perfect mille feuille, they are a little challenged in the salad department. In this way I can love France, because it isn’t intolerably perfect. Voilà! Or is this whole thing just a sign of my competitiveness? French author José-Alain Fralon has characterized the relationship between the French and the British by describing the British as “our most dear enemies”. I was delighted to see that tomatoes were absent—the only addition to the classic being chicken, which seems the accepted standard now. Not to be invidious, but if Weatherspoons can get the basic elements right, then why not an Aix bistro? Readers, we invite you to continue the food gossip! 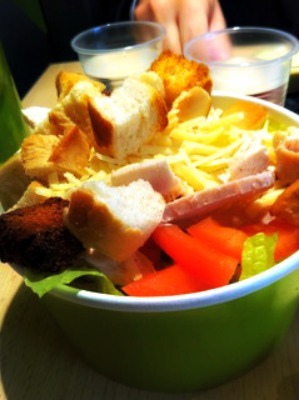 Have you noticed any abominations of your previous home food classics similar to what Joanna has observed with the French Caesar? Be sure to let us know in the comments! That was a fun read. Now that I have been introduced to the genre by this entertaining global food gossip, I shall keep a look out!